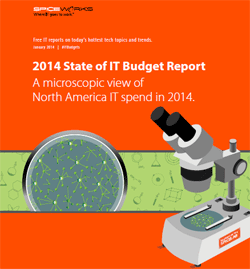 According to a report released yesterday by Spiceworks, North American IT professionals are optimistic about hiring, revenues and infrastructure investments in 2014. They are also optimistic about the prospects for growth within their organizations. As a company that strives to give those growing companies the power to do more, wouldn’t it be great to get a group of those IT professionals to come and talk directly to your teams and let them know what works and what doesn’t? 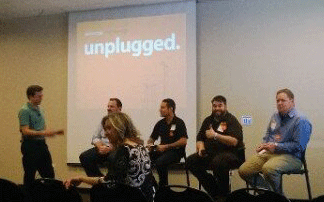 That is what Dell and Spiceworks did with their “Spiceworks Unplugged” event on January 15. If you are not familiar with Spiceworks, it’s essentially the LinkedIn for the IT industry. The company offers a free IT inventory and monitoring tool that also encompasses help desk functionality and an IT community with over four million users. Dell has been involved with Spiceworks for several years. It enables us to get feedback from the professionals using our products, address any issues they might have and hopefully prevent some, while also providing awareness of Dell’s end-to-end technology solutions. Recently four of their users, also known as SpiceHeads, participated in a panel style discussion at Dell’s headquarters around how they use the Spiceworks and what types of marketing material relate to them or grab their attention. While also providing some candid feedback to Dell on what we’re doing right and what we could improve on. There were many discussions around their buying process, a day in the life of an IT admin, and what technology are they looking forward to. What I enjoyed was the raw feedback of the panelists around what marketing ad’s worked and what didn’t. As you would expect from a group of IT professionals they want something that is not just trying to sell them something, but rather something that is funny or witty and will grab their attention. According to the panelists about 75 percent of their time is spent in the help desk part of the tool and the other 25 percent in the community. In learning that, I asked would they find it useful if we could find a way to embed some of the how-to videos we create on DellTechCenter.com into the Spiceworks platform. They all agreed it would be very useful because those 3-8 minute videos would help them with solving specific trouble tickets. All-in-all I think it was a great event with lots of valuable feedback. I know for me personally it has opened up a lot of possibilities for the way we use our TechCenter content. Hopefully this won’t be the last Dell/Spiceworks event.